Since the early 1900s, the science behind fire fighting foam has continued to evolve so that this type of suppressant could be used to combat an increasing variety of fires. Originally, foam was created as a way of fighting the difficult-to-extinguish oil fires. Since water does little to suppress this type of fire, foam was created to cool the fire and to coat the fuel, preventing its contact with oxygen, resulting in suppression of the combustion. However, since its original application was oil fires, the basic idea of the foam suppressant has been expanded to include additional flammable liquids. 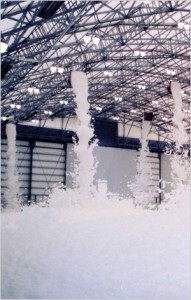 Each type of foam has a unique application. AR-AFFF is used for burning alcohols. Foam concentrates are extremely useful as fire suppressants because they are highly effective. They can knockdown the fire quickly with a lower volume of product than other agents. This reduces the likelihood of property damage and environmental impact. Reliable Fire & Security has a variety of Foam Fire Suppressant Agents for use in different industries. Reliable Fire & Security is the locally and nationally recognized leader in the fire protection industry, with over 50 years dedicated to serving the needs of our customers, fire departments, and the community.